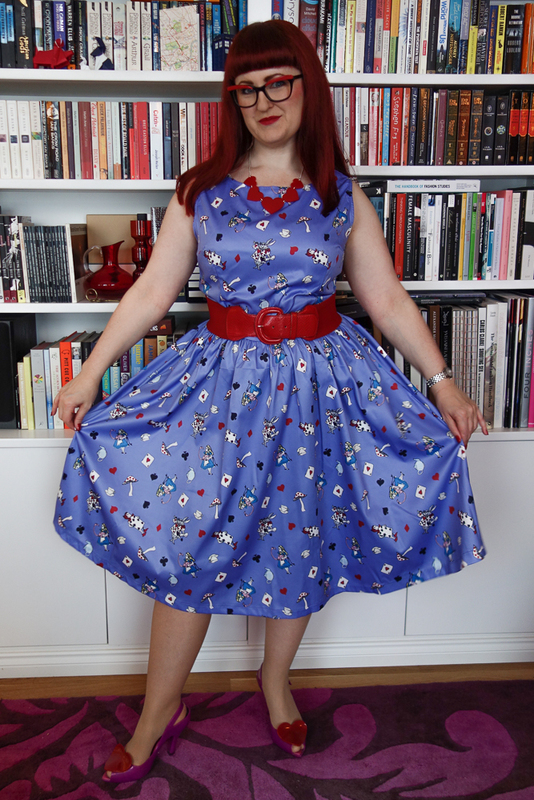 The lovely Gemma at Retro Chick wrote a wonderful post recently on novelty prints, featuring a cute Lindy Bop dress in a lovely Alice In Wonderland fabric. 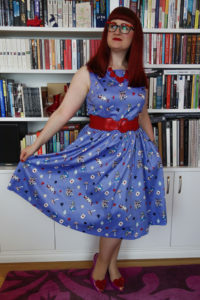 After reading this post, I spent quite a while browsing their site and discovered that they actually have three Alice in Wonderland print dresses, in different styles and colours. Even before buying my white rabbit brooch, I had become a tiny bit obsessed with finding Alice-themed items for my wardrobe – especially things that are more affordable than the gorgeous Irregular Choice Alice collection! – and these dresses looked like they would fit the bill. I ordered the Audrey in lilac Alice in Wonderland print, figuring it would work well in spring/summer and also with a blouse or long sleeved top underneath in autumn/winter. It’s made from a sturdy fabric which crumpled a bit in the packet and so needed a decent press when it arrived (I ironed it using a wet hanky to steam out the creases without scorching the fabric), but it has a nice long zip at the back so I didn’t need to put it on over my head to get my hips in. The skirt length is good on me (would be knee length on anyone taller than 5′ 5″ I reckon) and the dress has pockets, which is always a massive plus point! However, despite checking the size chart, the size 16 is actually a bit big for me. 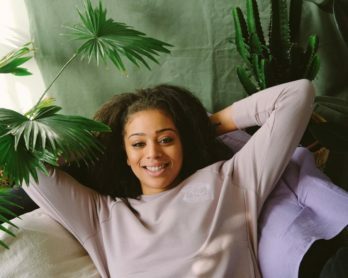 I’m a ‘pear shape’ (big hips, small waist and bust) so I can hardly ever wear pencil dresses and I’m used to flared frocks that fit me on the waist being too big on the bust, as every style I like is designed for an hourglass figure. 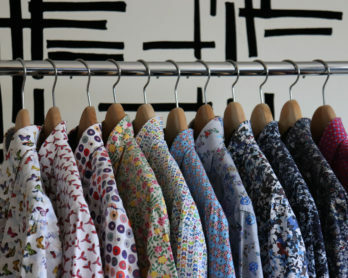 It turns out that I could actually have gone for a size 14 in this style as it seems to come up a bit big. However, seeing as my plan was to ditch the thin belt that came with the dress and wear a wider elastic one, I decided to cinch the waist and just live with it. After all, on some days, it’s useful to have a bit or extra room around the waist band! In the photos, I’m wearing my ‘two cup sizes bigger’ bra that always manages to balance out the tops of dresses for me, plus a Punky Pins necklace, an old Debenhams belt and Vivienne Westwood for Melissa shoes. 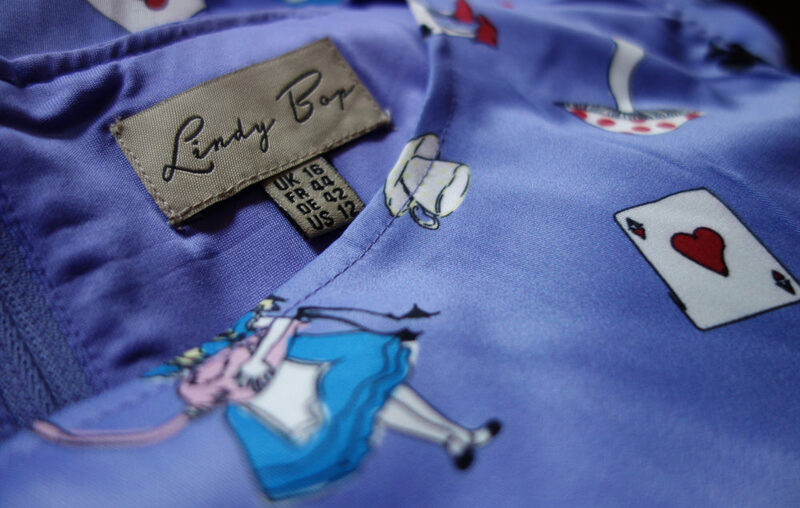 Lindy Bop clothes are available in sizes 6-26 and there are loads of new styles on the site to tempt you. I also bought 4 Lindy Bop dresses, but they didn’t look as good as yours. I had to return all 4 of them, because the tailoring was awful. Customer service is also horrible. I’d advide everyone avoiding them.